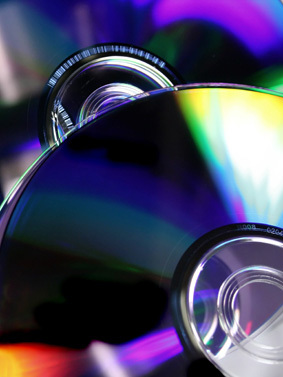 DVD Replication – We undertake DVD-5, DVD-9 & DVD-10 replication and now Blu-ray 25 and Blu-ray 50. DVD-5 is a single layer disc holding 4.37GB of information. This usually equates to about 120’ minutes of footage with the ability to have full colour print on the disc surface. DVD-9 is a dual layer disc holding 7.95GB of information. This can be up to roughly 240’ minutes long although this in practice is rarely fully utilised and like DVD-5 can have full colour print on the disc surface. DVD-10 is in essence 2 x DVD-5’s bonded back to back. This means the disc will hold 4.37GB of information per side and will need to be turned over to play the other half. Because each disc surface needs to be read only a small surface area of the disc can be printed. ALL DVDs will have onbody print and can be supplied on spindle (i.e. loose) or as fully printed, packed and wrapped items.